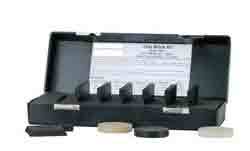 The PCE-A hardness tester is a standard model for measuring the rubber hardness (Shore A). The hardness tester consists of a device with a pressure pin and 360° anti-glare dial with an accuracy of 0.5 hardness units. The device meets DIN 53505, ISO 868, ISO 7619 and ASTM D 2240. standards The hardness tester comes calibrated and ISO certified. The device can be recalibrated at any time with included ISO calibration certificate (at additional cost). Optional accessories for the PCE-A are a test position and a test control device to verify the accuracy of the device on site. Random testing for product control combined with the test position will ensure the best results with high accuracy and repeatability when measuring the rubber hardness. At the following link you will find an explanation of the process for measuring hardness. You will also see a classification of the different grades of hardness if you click here. The type-A test control shows if the hardness tester will operate within a specified tolerance. These tests are used in production as well as reasearch and development. In the box you will find seven tests. The tests are identified by a series of numbers to ensure that they are not misidentified. The range of hardness of type-A is from 30 to 90. The tests serve as a reference check of the optimal state of the hardness tester operation. The hardness tester must never be recalibrated during the control tests. Dimensions: approx. 54 x 54 x 8 mm (test). The test position of the OS-2 hardness tester is deisgned for series of tests in order to achieve accurate and repeatable results. Subjective measurement errors caused by improper contact pressure or non-vertical measurement are excluded. The sample is placed on the anvil and the hardness tester goes down with a constant test force - with the help of a lever. The result is shown on the hardness tester itself. The device is made of aluminium. An adjustment allows the examination of large and small parts. After some time of using the device, deviations in results can appear. We can perform a laboratory recalibration anytime as well as an ISO certification.